One Year – Cin Cin, Let's Eat! A year ago today, Joe and I said our vows to each other and exchanged rings in front of 180 of our family and friends. We celebrated at a gorgeous golf club with great food and great company. It was a day that we will cherish forever. 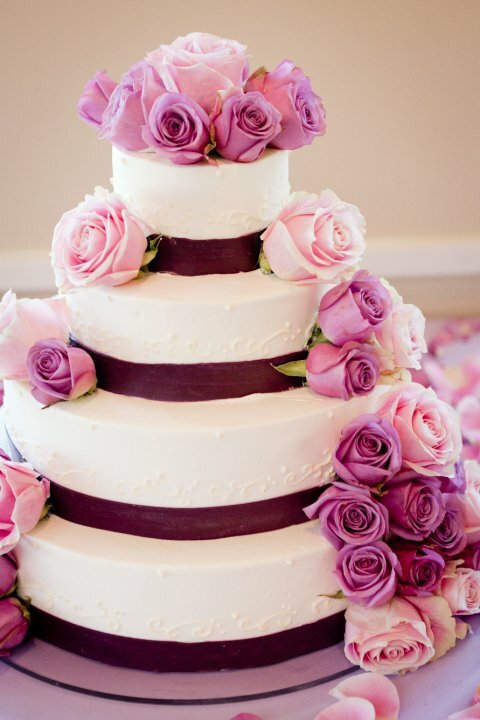 Our delicious wedding cake was from Satura Cakes. The bottom tier was strawberry shortcake, the middle two tiers were mango-passion fruit with red currants, and the top tier was green tea chiffon with vanilla bean cream. Besides the 4-tier cake, we also ordered a half sheet of mango coconut mousse cake, and a half sheet of classic chocolate – chocolate sponge with light and dark chocolate mousse. SO DELICIOUS! Satura’s cakes are lighter than most as it is a Japanese-style bakery (which adapted to European-style techniques), so their products are not as dense and sweet like most American bakeries. They also specializes in fresh cream. Instead of the normal buttercream frosting or rolled fondant, Satura frost their cakes with fresh cream. They spread and frost it so smooth that it looks like fondant. You’re probably wondering if we froze slices of our cake for a whole year…Seriously, cakes don’t last more than two days in our fridge. And no offense, but I really don’t want to eat one-year-old stale cake that tastes like the fridge. We requested the venue to save our top tier so that we may share it with our parents the day after the wedding. Time sure flies by quick! To celebrate, we spent a relaxing and gourmet-filled weekend in Napa, more on that later. We spent our actual anniversary at home so I decided to “recreate” the top tier of our wedding cake, the green tea chiffon cake. 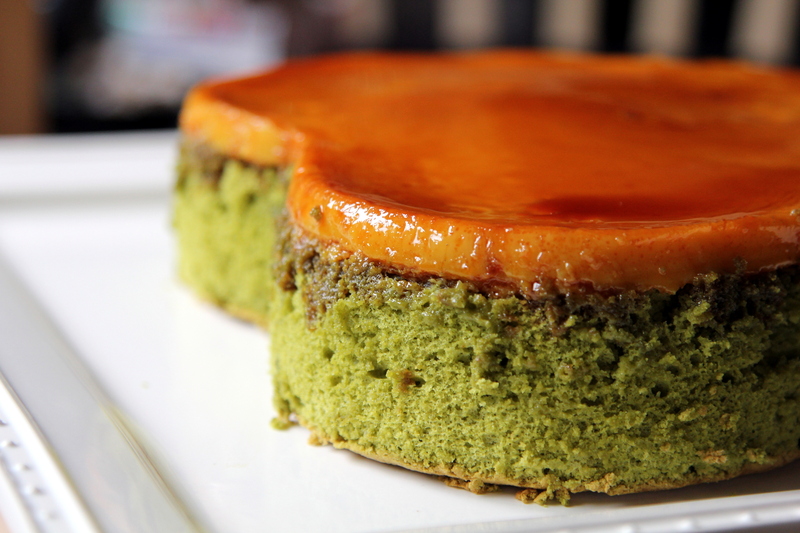 Instead of the vanilla bean cream, I am adding on a layer of vanilla leche flan or custard, making it a “green tea custard chiffon cake,” sort of a twist on a Filipino classic. Recipe adapted and modified slightly from here. Most measurements are in grams, luckily I have a digital scale that can toggle between lb and grams. Put the sugar in the cake pan and cook over low heat until the sugar melts and turns dark brown. 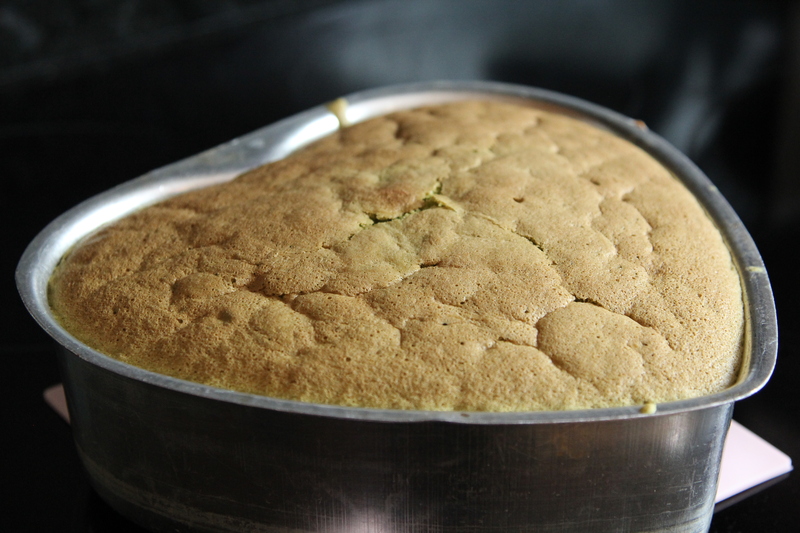 Spread evenly on the bottom of the cake pan. Be careful, the cake pan will be very hot. Don’t use nonstick pan, and don’t grease the pan. Once the caramel coats the bottom of the pan evenly, let it cool down. It’s okay if you see the hardened caramel starts to crack. Mix together all the custard ingredients. Run through a sieve to prevent lumps and bubbles. 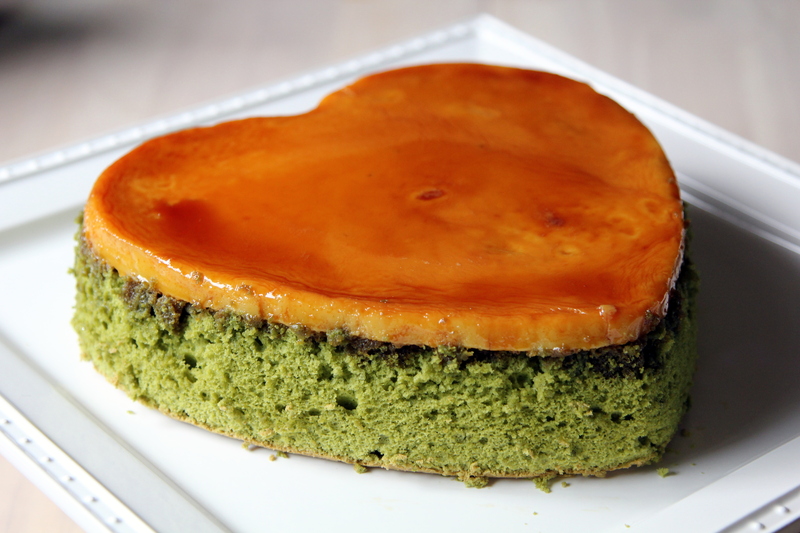 Sift together the cake flour, baking powder and green tea powder into a large bowl. Add the rest of ingredients in list A and whisk quickly for about 1 minutes until smooth. Don’t over mix or the cake will be tough. Once the egg whites are foamy, slowly add in sugar and beat until the whites hold firm, shiny peaks. Add 1/3 of the whites to the yolk mixture and fold in gently. Carefully fold in the remaining whites just until combined. Pour in the custard mixture in the pan, follow by the green tea batter. Don’t worry about mixing. The cake batter is lighter and will float to the top. Bake for about 40 minutes. The cake is done if it starts to pull away from the pan, and when the toothpick comes out clean. Carefully run a knife around the edge to free the cake, then invert the cake immediately. If you wait too long to invert, the caramel will stick to the pan. (Optional) Sprinkle turbinado sugar on the top of the cake and use a torch to turn your top layer into creme brulee. That looks fabulous!!! Can they be made into bite sizes and therefore a potential item for a tea party….?? Pingback: Just Pictures: 2nd Anniversary Celebration « Cin Cin, Let's Eat!